...so, here is what it is, why we do it, how we do it, and when. “Pruning is a horticultural practice that alters the form and growth of a plant. 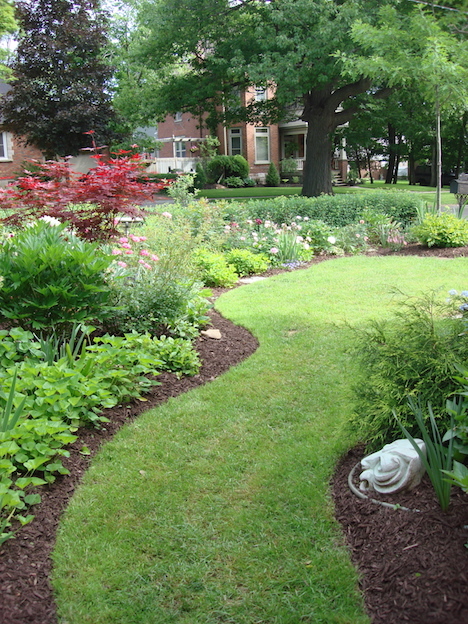 Based on aesthetics and science, pruning can also be considered preventive maintenance. Many problems may be prevented by pruning correctly during formative years for a tree or shrub”. 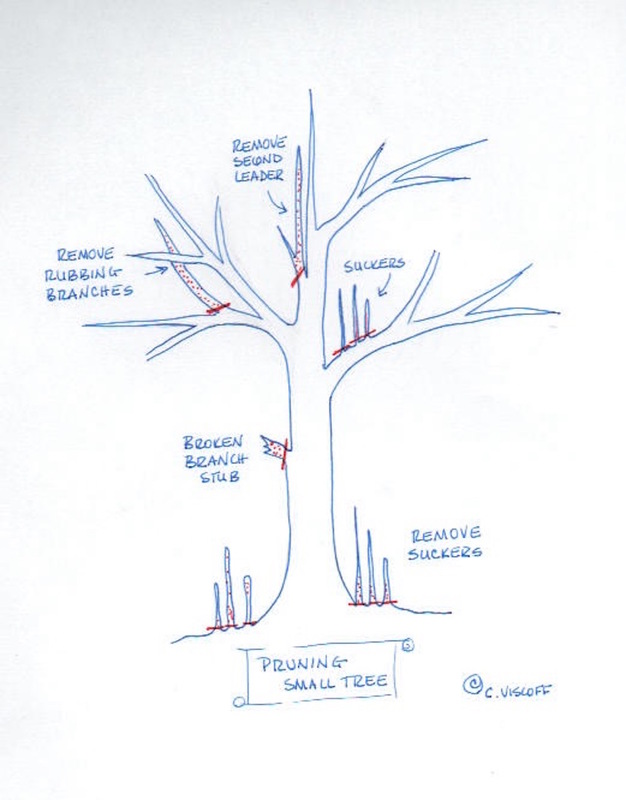 Why Do We Prune Trees and Shrubs? to maintain a pleasing shape - (don’t plant a tree with one natural form, thinking you can prune it to take on the shape of another. Plant one for its natural shape and prune it to stay that way. to encourage the tree or shrub to produce flowers, fruit and/or seeds. "The best friend on earth of man is the tree: when we use the tree respectfully and economically we have one of the greatest resources of the earth". The experts say: “late dormant season”…. which in our zone 5, means later winter and really means before the spring growth begins. In early March, (meaning “late winter or early spring”), and still with 3 feet of snow on the ground, the snowbanks could still be 6 feet tall. It is easier to see the shape of your trees and shrubs and then decide when and what to prune. One rule of thumb is to prune before new growth happens because any pruning wounds (open bark) will seal over more quickly. NOTE: trees do not heal, they seal. ... and they do a good job by themselves. In the past, arborists have used a tar-based sealant over a cut branch wound. Research has shown this can delay the tree’s natural ability to seal over the wound which can cause disease and some insects to use this as a place to make home. When we prune living tissue, we put the tree into some shock, depending on how hard it has been pruned. Pruning shoots and branches with live foliage slows and often stops ROOT growth because the tree is now attempting to replace those branches we just removed. Pruning trees and bushes while dormant lets us see the shape of the bare branches. In dormancy (where there is no obvious growth) the roots are working but the buds are waiting to open. NOT between April and October - this should should avoid Oak Wilt. If you have to do some pruning during these months, you must apply a wound dressing that masks the odour of freshly cut wood - because the beetles who spread Oak Wilt, love that smell. (This is one of the few exceptions for covering any pruned wound). “Disease symptoms include dieback of affected branches, reduced foliage, yellow foliage, premature fall coloration and early leaf drop. Cankers (areas of dead tissue) are found at the base of trees, at branch crotches, around wounds or on branch stubs. Cankers can range from slightly flattened surfaces to distinctly sunken areas with large callus ridges at the canker margin. Areas of stems and branches with thin bark may have a red-yellow discoloration. The condition of the bark and cambium (the tree’s growth tissue, between bark and wood) can indicate the presence of a canker. Infected bark and cambium will be loose and wood beneath them may have a dark, wine-red to yellow discoloration instead of a normal white or light color. The reddish color associated with the center of honeylocust stems is not related to these diseases”. Even though pruning in late winter is often the best time, for apple trees, you may be pruning off the fruiting wood. So take only the dead, dying or diseased wood and save the hard pruning for the summer after they bloom. There are many good videos by fruit farmers that show you how. Late winter is the best time for the above trees, as pruning in the spring or summer can increase the chance of disease such as the bacterial “fireblight”. Pruning in fall or early winter can cause the pruned sites to die back. Fireblight is a systemic,contagious disease. The term "fire blight" describes the appearance of the disease, which can make affected areas appear blackened, shrunken and cracked, as though scorched by fire. Primary infections are established in open blossoms and tender new shoots and leaves in the spring when blossoms are open. Once deposited, the bacterium enters the plant through open stomata and causes blackened, necrotic lesions. These trees, are like the sugar maples and have sap that starts flowing in early spring. If pruned when the sap is flowing the tree appears to bleed. This does not do a lot of harm, but it is better to prune once the leaves are fully out. Remember not to take off more than 1/4 of the live foliage. Prune these AFTER they finish blooming, otherwise you will prune off the buds that are meant for the next spring flowering. If you prune summer-flowering shrubs late in the summer or early fall, you are likely to stimulate new growth that will be too tender to survive winter. These shrubs are usually planted for their foliage, and not necessarily for their blossoms, so prune them in early spring before any growth begins. Shrubs that bloom on new wood, should be pruned before any growth begins such as Annabelle Hydrangeas: cut these back to the first pair of buds just above the ground. The stems will be stronger to support their large heads. I like to cut the Annabelles - (Hydrangea arborescens) back in a staggered manner - especially if they grow next to a wall…this way the blooms cover the bush in layers rather than all at the top. Clematis and shrub roses should be cut back to live wood. Spirea - the old-fashioned kind that grows out of control and often in hedges, spills over sidewalks and gardens, can be cut almost to the ground every few years to bring it back to a healthier look. It will not usually bloom the first year it is pruned back, but will most likely the second year. This Spirea Hedge above, full of white flowers, spilled over the garden and over the city sidewalk. On the left above, I cut back the hedge in very early Spring - with my secateurs (hand clippers). It was time consuming and I took a lot of kidding from my neighbour who hacked the top of his off - with electric shears. I cut out the dead stems to the ground, and then cut the other stems in a staggered manner so the foliage would grow up along the canes, or branches, all the way to the top. On the right above, this is the hedge the end of June (seen just above the garden to the right of the Japanese Maple). Very few flowers (until next year) but lush and healthy. My neighbour's hedge had all new growth at the top, and bare stems along the bottom. Now you know when to prune and the tools to use…let’s get into the How of it all. Cut part of a branch back to a bud that is facing - or heading- in the direction you wish it to grow- this is for shape. 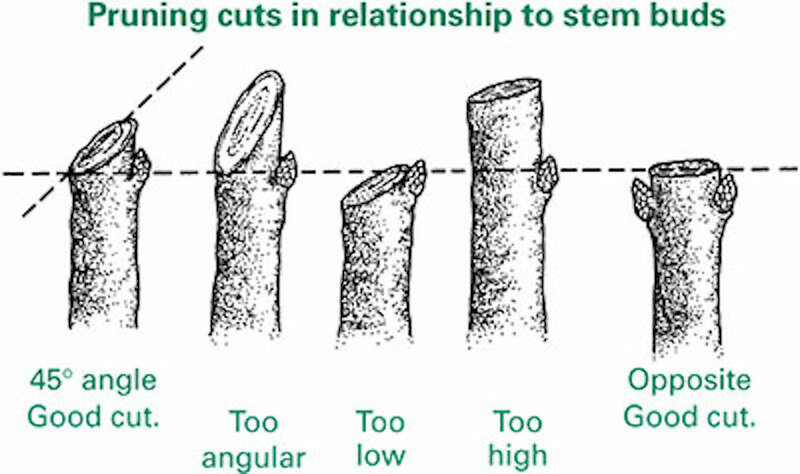 For these cuts, prune just 1/4 of an inch above the bud and slope your cut down at about a 45 degree angle. These cuts are for reducing the size without changing the nature of its form and takes off the whole branch down to almost the ground. (for these cuts, make them about parallel to the branch beside it and watch the way the bud is pointing because that is the way the new branch will grow). Start with the 4 D’s…. Remove any dead, diseased, damaged or double-crossing branches, including old branch stubs. Next, remove all suckers or water-sprouts (the ones that grow straight up- making the tree look like it has a bad haircut) - they syphon off the nutrients that the tree and roots need. Then any branches that are crossing and/or rubbing on others - take out those that grow toward the centre of the tree. Although you will need some growth in the middle, too much will keep air and light from the tree - trees need air, light and water in order to pass the nutrients to the roots. Never cut or prune the leader- if there are two, remove the one that is least likely to contribute to the overall shape and health of the tree but only if the tree is young and the cutting will not kill the tree. Then, before you do one more cut - step back to see where you should go next…. Leave those with the most potential to add to the shape, strength and structure of the tree..
Do not put any type of paint on a pruning cut. If the cut is made properly, the tree will take care of the rest. Do not “top” trees - when you remove those large branches from the top of the tree, you not only harm the tree’s natural shape, you decrease the living leaves which promote photosynthesis needed to gather nutrients that feed the tree’s roots. This way the plant can keep renewing itself with as little stress as possible. Shears work well and quickly, but they do tend to bruise and tear leaves. Even if you trim the top of your hedge regularly, it will not produce more growth from the bottom and the flowers will tend to be only at the top. Trimming off the top, cuts off the flowering buds and encourages thick foliage - this will begin to shade the bottom and inside of the hedge. The interior will become woody and dead with fewer and fewer flowers. (Spirea, especially). 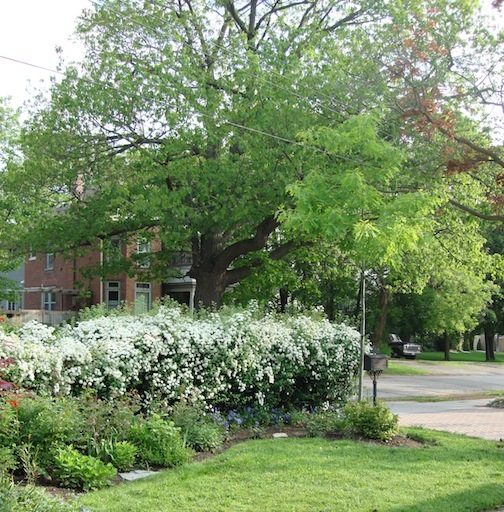 Privet and Spirea will come back vigorously when pruned almost to the ground every 4 or 5 years, and will bloom again. Pruning is an art. 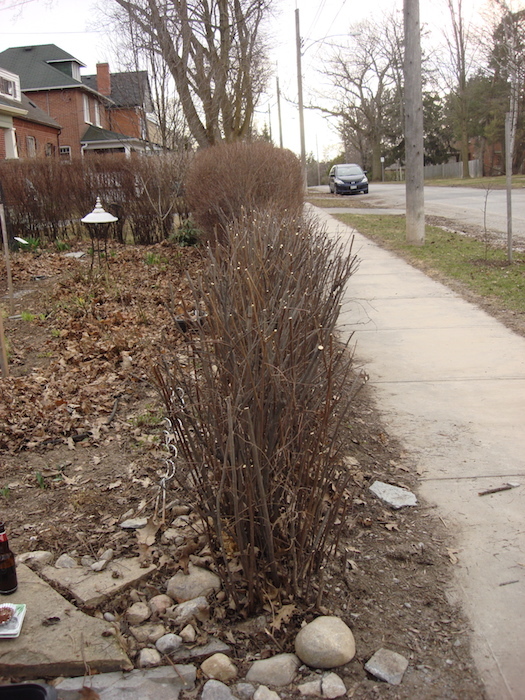 Anyone can "trim" a bush, but to prune for health and shape is a special skill. You can learn to do it yourself, but if you don't have time, then hire someone who prunes by hand. Electric trimmers are used for trimming. Hand pruners, of course, are used for pruning. If you intend to hire someone, be sure to ask how they do it exactly and make sure they do as you ask.